Scandinavia, Inc. in New Orleans' Office Furniture offerings include unique but functional, modern and contemporary desks, returns, filing, credenzas, chairs and office accessories from around the world. We also import modern Danish furniture and Scandinavian office furniture which have beautiful and unique styling while being residential or commercial-grade product. 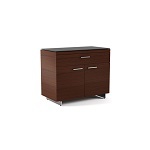 Choose from a variety of desks/meeting tables, computer furniture, modular office furniture, conference room furniture, wall systems, storage units, bookcases, hutches, office chairs and accessories.